Finally got it. It wasn't the png file but a mismatch between the pbl and png file. The terrain I want to create is relatively flat, max height is 60 meters so I set the height range in the pbl file from 0 to 65 meters. Apparently there where more then 65 'gray' colors in the png file so Visitor couldn't create the correct heights when I tried to import the file. Problem solved :) I used a height range from 0 to 250 meters and corrected the height afterwards in Visitor and with the erosion tool. Thanks all for the help so far! Very nice pics all! @ Parvus: it's called "Leusderheide" not "Leudersheide"
Absolutely f*cking amazing! Just wondering how you cheated the 512 limit texture count. 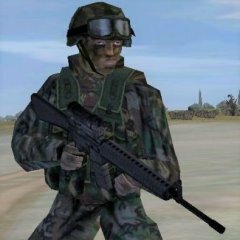 If this is still possible within the old engine , then I'm wondering what should be possible with ArmA. We'll I think I will stick to the method I'm using now, just alter the texturepath in O2. We're talking about pretty big textures here (2048x2048) so scripting with those is not very lag friendly I think. I should think of a patch system which allows me to implement new models/textures in de pbo file. But if someone else knows something better, please give it a shot. Only the last three posts I guess.. lol Anyway, Kikill, do you know such a script? I thought that was only possible with the setobjecttexture command which only works for small textures. About the Russian airliner, I guess I can't go wrong with the IL-86 But I liked the look of the IL-62 and the Tupolev 154 so I will create those too . @ shashman; that's exactly what I was talking about, these kind of vehicles go perfectly with the planes. I think SnD is still in my Msn list.... @Miss_cleo; yes, I allready mentioned it, so I guess I will create some paintkits. @the-Architect; All planes use one large texture, 2048x2048 or 2048x1024. This very much simplifies the creation of other liveries. You just paint your thing, alter the texture-path in O2 and save the model under a different name. Easy does it . O, and yes, the pictures are taken on Bonaire isle, another project which i'm working on. @SnD; Static versions do not have more then 2000 points in the first LOD, mainly because there's no interior. So yeah, the are more low poly then a possible flying version. @smiley_nick; the models are made by myself, I only use the textures from FS2004, but they have to be modified for OFP offcourse. As far as I know it's nearly impossible (at least with my knowledge) to port a FS model to OFP. I also figured that we need some miscellenious stuff to go with these planes, like cargo trolley's, fuel truck and nose wheel cars (you know, those low cars to taxi a plane from and to the gate). @Manhunter; we'll see... @reconninja; that would be indeed a nice addon for missions, gotta think about it. @shinraiden; that's a very cool island and certainly big enough, but doesn't it lag to much? It should be perfect for ArmA I guess. As far as I know hidden selections and the setobjecttexture are only for small sized textures like 64x64 and certainly not for 1024x1024. I'll see what I can do about all these requests, but I think I will create a paint kit for the planes, so everyone can create his or her favourite airline. @sniping jack; All planes are setup so the can be made functionally relatively easy. @student pilot; About some sizes, the 747 is also to big for OFP geometry, so I guess I have to make some compromises for that one. At the moment I only have the 737 -300 series, but some other could be very easily done too. Other planes like Concorde or Dc 8/9 could be made.. if I find the time for it. That leads me to another point; Do you guys think it's wise to release every plane as a seperate addon ( DC10 series, 737 series etc etc) or as one large pack? Say, guys, what do you think of a paint kit for the planes? Just an idea, but this would lead to a much bigger variation in planes i guess.. shame I can't do a poll now in this topic. The KC10 is on my list, so I guess you can give me that cream now . hehe. But don't forget, somebody allready made a working KC10, but it was only in beta stage. I don't no who made it... Enterable planes are very cool, but i think that should be a feature for Arma, you know with all the bad geometry in OFP.. Besides that, I would like this project to be fairly easy, since I have a lot of other projects which I wan't to finish some day.